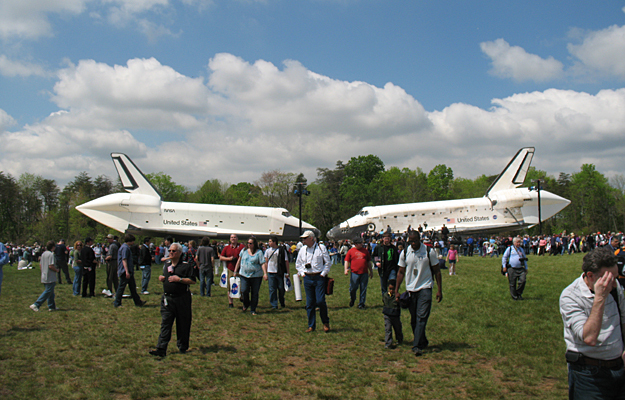 NASA transferred space shuttle Discovery to the Smithsonian's National Air and Space Museum during a ceremony Thursday, April 19, at the Stephen F. Udvar-Hazy Center in Chantilly, Va.
"Today, while we look back at Discovery's amazing legacy, I also want to look forward to what she and the shuttle fleet helped to make possible," said NASA Administrator Charles Bolden. "As NASA transfers the shuttle orbiters to museums across the country, we are embarked on an exciting new space exploration journey. Relying on American ingenuity and know-how, NASA is partnering with private industry to provide crew and cargo transportation to the International Space Station, while developing the most powerful rocket ever built to take the nation farther than ever before into the solar system." National Air and Space Museum Director, General John "Jack" Dailey said, "Discovery has distinguished itself as the champion of America's shuttle fleet. In its new home, it will shine as an American icon, educating and inspiring people of all ages for generations to come. The Museum is committed to teaching and inspiring youngsters, so that they will climb the ladder of academic success and choose professions that will help America be competitive and successful in the world of tomorrow." In this new era of exploration, NASA will build the capabilities to send humans deeper into space than ever before. NASA is using the space station as a test bed and stepping stone for the journey ahead. The agency is changing the way it does business and fostering a commercial industry that will safely service low Earth orbit, so NASA can focus its energy and resources on sending astronauts to an asteroid by 2025 and eventually to Mars in the 2030s. The space station is the centerpiece of NASA's human spaceflight activities in low Earth orbit. It is fully staffed with an international crew of six, and American astronauts will continue to live and work there 24 hours a day, 365 days a year, as they have for more than 11 years. Part of the U.S. portion of the station has been designated as a national laboratory, and NASA is committed to using this unique resource for scientific research. The station is testing exploration technologies such as autonomous refueling of spacecraft, advanced life support systems and human/robotic interfaces. Commercial companies are well on their way to providing cargo and crew flights to the station, allowing NASA to focus its attention on the next steps into our solar system.